St. Nicholas Day is about a month away - time to order resources. Perhaps you could include this booklet by me, written for Creative Communications for the Parish. St. Nicholas, a fourth-century bishop legendary for his charity and love of children, has been revered throughout Europe and North America for over a thousand years. Written for elementary school children, author Amy Welborn emphasizes the importance of Nicholas' love for Jesus as the motive for his concern for others. 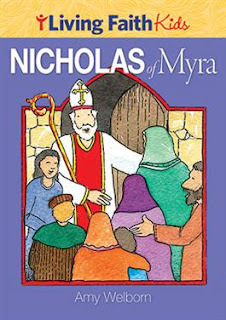 Along with narrative about St. Nicholas and the traditions that have grown up to commemorate his life, this booklet includes prayers to remind children of the miracle of God's love for us in Jesus.